In the realm of today’s mainstream culture, robots are largely seen as nothing more than machines: unfeeling, cold, utilitarian, and lifeless – nothing more than a glorified computer. 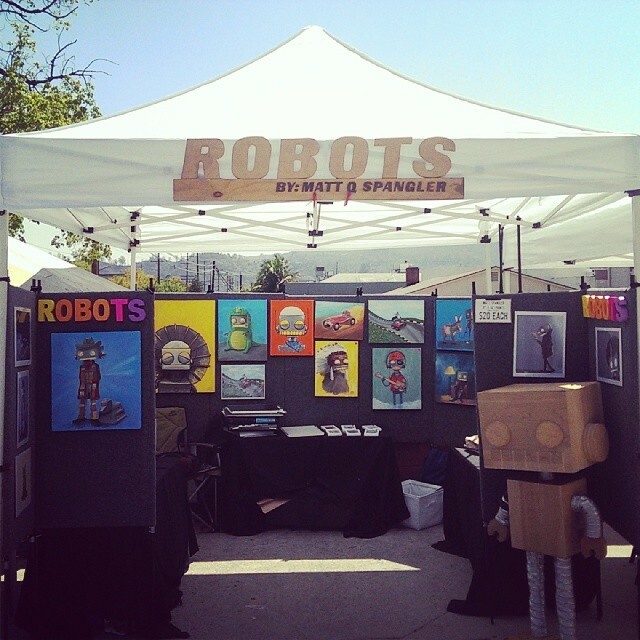 However, for Matt Spangler, an artist from San Diego, robots are not limited to (and, in fact, do not at all resemble) this mainstream view. A painter and illustrator of robots, Matt contradicts the notion that robots are inhuman, giving each of his robots a distinct character; some, like the little robot riding a squirrel in the print “I’m on an F’n Squirrel,” are daring and adventurous whereas others, such as the one delicately admiring a butterfly in the print “Flutterby,” are gentle and timid. Illustrated in a style comparable to that of the Calvin and Hobbes cartoon, the robots are playful, endearing, and incredibly relatable – a testament to Matt Spangler’s talent in creating more than beauty but personality in his art.